Back in the U.S.A. for a few weeks. Decidedly overdue to start a new thread. 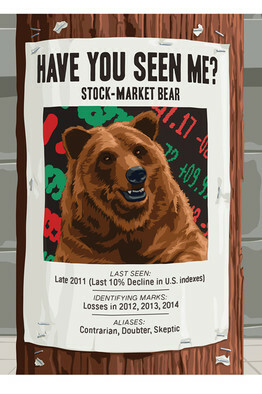 What else can one say at this point other than this is a rip snorting bull market that continues to defy mortality? The SP since 2009 has outrun the record 1995-2000 bull market and we thought that was truly remarkable at the time. Currently price is stretched by all technical measures to record extremes yet exhibits no signs of reversing in any timeframe. 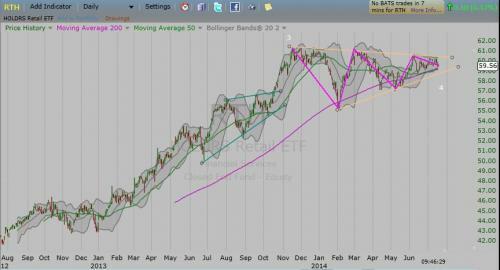 I have posted the monthly chart with its 20 period BB stretched like a rubber chicken. Never been anything like it in entire history of market data I have back to 1920! Bubble markets are still bull markets no matter how unbelievable it is that long term buyers are still going at it. My stock allocation is minimal so I am taking the ZIRP punishment like many retirees that have been undeservingly dealt the consequences of 2008 crisis. I enjoy trading to pick up some extra coin and have gotten pretty good at spotting low risk set ups. Currently I continue to hold onto my energy etf's (see prior thread and posts) but that's all. Anyway it would be reasonable from a technical view to at least expect the SP to retest the middle BB 20-month MA line and even more reasonable to expect a back test of the the 2000 and 2007 highs for support. But reasonable it seems is such a relative term these days. Daily reversals showing up today on many indices, see how the week ends up. Here is updated SP 500 EW chart with my count and at the last post I was looking for a throw over of this 5th wave of the higher degree 5th wave terminal impulse wedge. 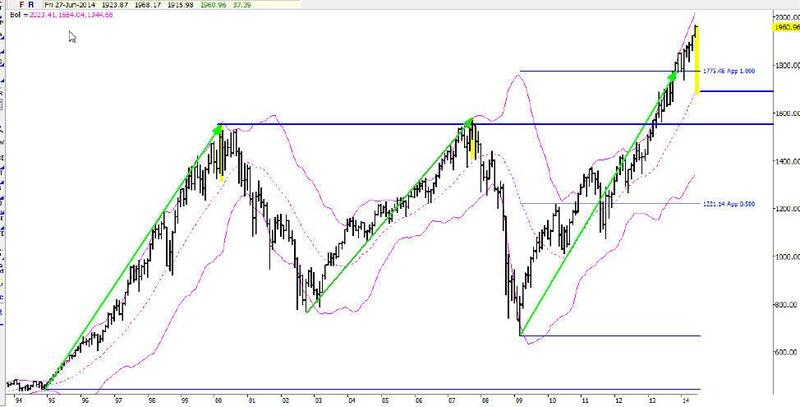 I had FIBO projections posted to the 1980-1990 area, the new high printed last week at 1985. If we get a weekly reversal signal I will open a conservative short position(s). 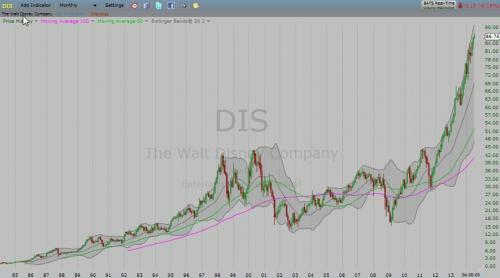 I am heading back north at end of the month but this is as good a "pick the top" trade as any previously along the way! The RUT also is at a potential second top pattern, COMP appears to have had a final pop top 5th wave and potential 2B top, and the BIOTECHS have staged a substantial secondary rally but not exceeded their previous high and could therefore be about to go into a 3rd wave down. Anecdotal reversal signals include the VIX at historic lows along with extremely anemic volume and sentiment indicators of many varieties surging to euphoric levels. So obviously daily sells instantly negated thus not even getting close to weekly sells. 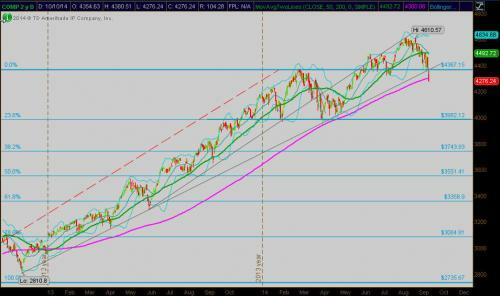 Looks like next stop will be S&P over 2000! DIS looks like a great buy here whilst we enter FANTASIA hearing on almost daily basis crapvision pundit calls like another 10 years in this bull market and DOW 30,000 by 2020. Russell 2000 ; So far small caps, retail, housing, and banks are stalling out, large cap SP, DOW and NAS 100 and their pharma, tech, healthcare, defensive, etc components crawl higher. Interesting divergence that seems to suggest the average American consumer may be running into trouble soon, perhaps for them, the credit expansion during this cycle is coming to a close?? 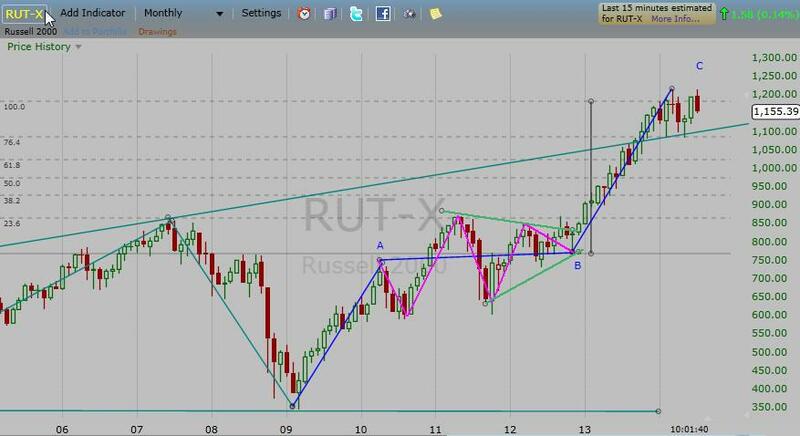 RUT thus far is in a ideal double topping area and so far we have a weekly bearish engulfing candlestick pattern in place. 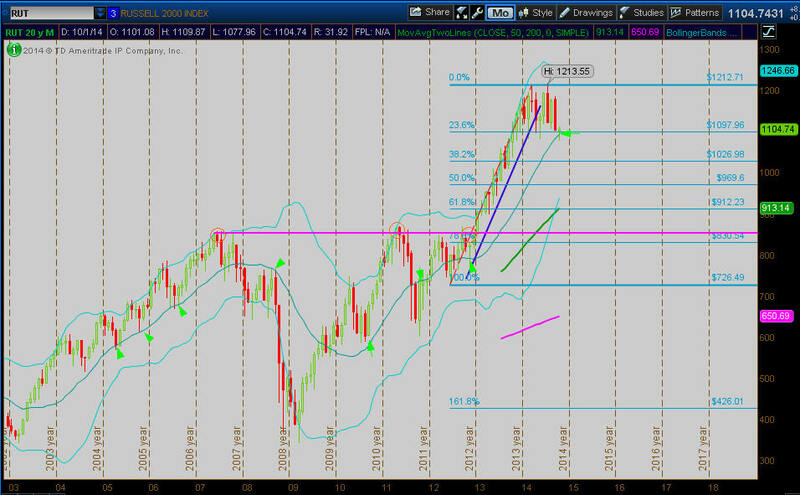 See if remaining weeks turn it into a monthly one. I am watching closely to see if this breaks down leading the way to a larger market correction. My Elliott Wave count on this monthly chart shows a clear A-B-C corrective rally with a common B wave triangle and now wave C at the price equivalency of wave A. This is the most common relationship for completion of the structure. 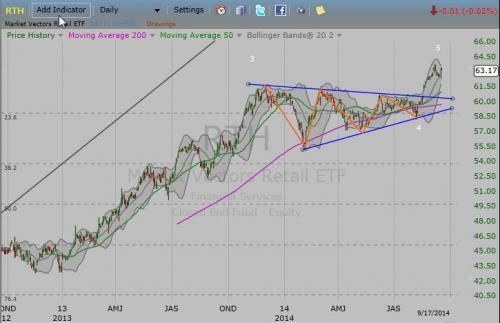 Here is the chart of the RTH retail holders approaching the apex of a large triangular consolidation, the volatility contraction sure looks to be close to its end. 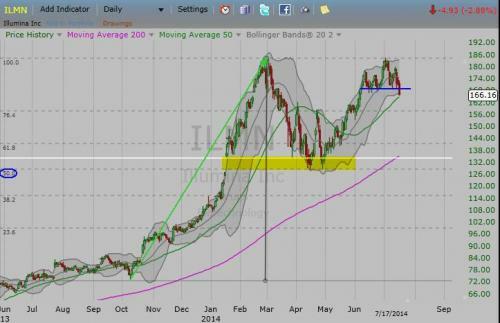 The break out will make a great low risk trade set up. Earnings to be reported on Weds, so must stand aside for now! 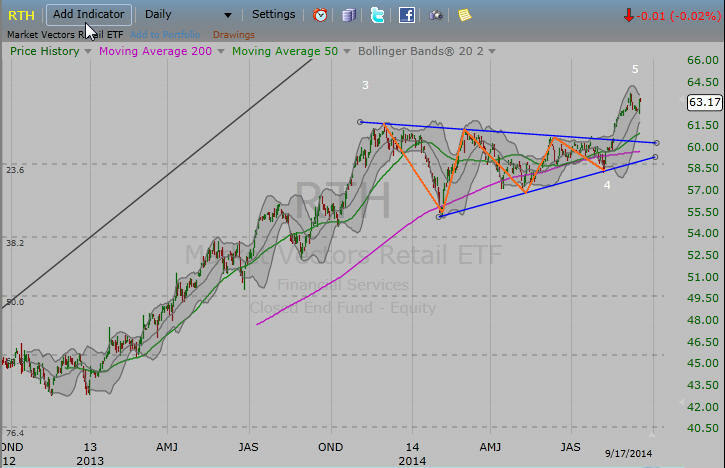 Retail Holders RTH: closer look with daily chart showing a perfect Elliott Wave triangle structure and its getting ready to pop, the direction should be very telling about the overall market. Triangles most commonly appear in Wave 4 positions which my count indicates and would favor a bullish break out leading to the FINAL Wave 5 move up, however they are equally common as powerful termination structures (Neely calls them unlimiting triangles, wave 4 are always limiting). Back from Canada! I see a few changes with the definite break up in the DXY (I believe is start of wave 3 big move) and break down in GLD, crude, and most commodities. I sold half my position XLE for about a 18% gain and nervously holding the rest. Repositioned the cash long the US buck. TNX and EQUITIES really don't see anything significant has happened. Market is just churning higher with the risk on rejuvenated; biotechs gapping to a new high and the internet bubble 2.0 stocks along with Tesla setting new highs too. Janet reminding us they operate on a target range with no bullseyes! Well the suspense here is over with the retailers etf, RTH, breaking out to the upside of a nice 5 wave triangle and helping the markets inch higher and telling us we are in a final wave 5 advance. 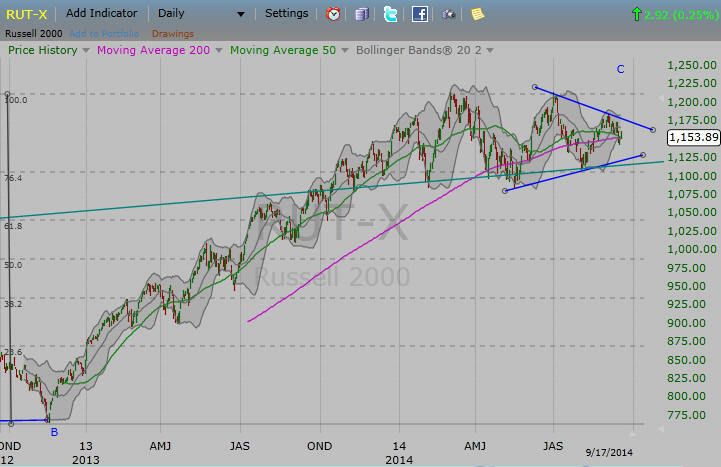 Russell 2000 now forming a triangle that should be getting everybodies attention! 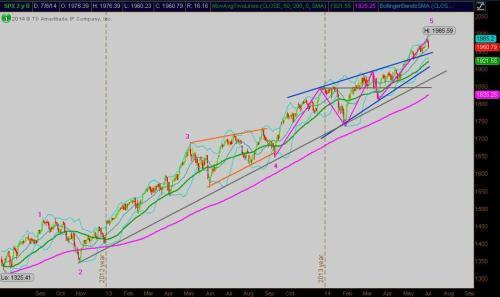 Again its either a Wave 4 or powerful non-limiting triangle TOP! Early this year when crude was down here I was looking for it to break down and was a bit early. Much more confident this time it will. Now a very clear EW double corrective structure is complete: zig zag - X - triangle. Broke out of the triangle and now at second strong supportive area that I previously referred to as the "balance point" which is the 50% FIBO of the 2008 crash from 148 to 33 in 2 months. Prechter and EWI boys say that was the steepest, most severe crash of any commodity in history! 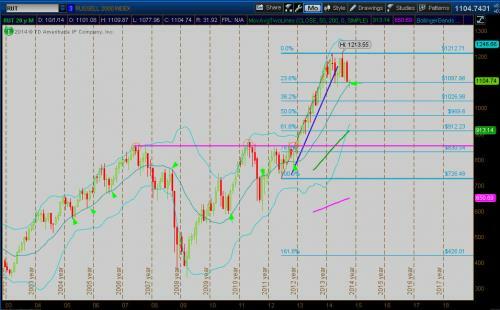 A decisive break down below this 91 area should result in an accelerating downtrend with $77 next stop. 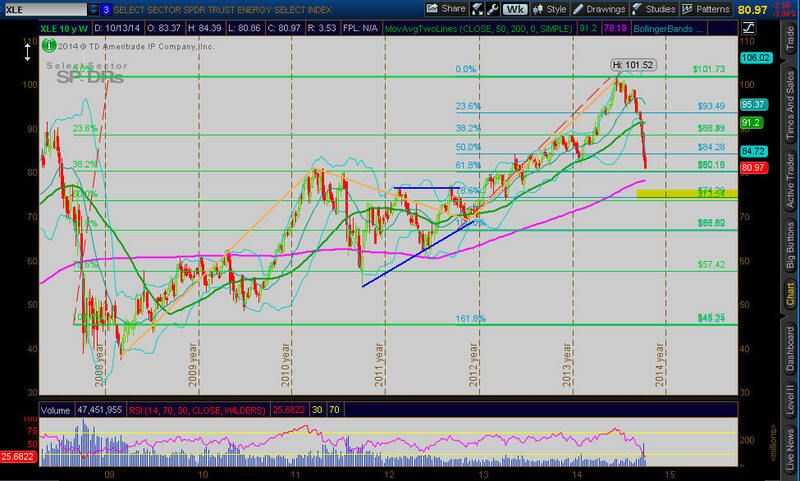 So here I go again predicting sub $3.00 gasoline. Overall it is becoming increasingly apparent we are seeing what could be a significant deflationary wave sweeping the globe! This is another stock market crash window that has more going for it than the March-April time period. Russell 2000 posted an EW triangle, also could look at it as a basic TA double head and shoulders. We broke out of the triangle and now testing the H&S neckline area. I am short small caps using SBB. I sold remaining XLE today for small profit. Long dollar since early last week. Gold is going to sub - 1100 , smaller likelihood of a dip to sub-1000. 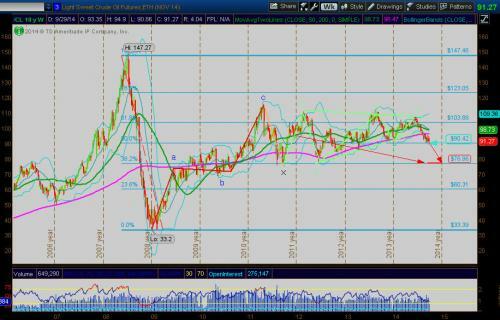 Once this wave 5 is over I will be looking to try longer term buying opportunities. So a good job report just as major support areas are being tested on various indices and we get a strong positive reaction. Next week will tell the real story but I am keeping my small bet (SBB) in case this time we fall through. 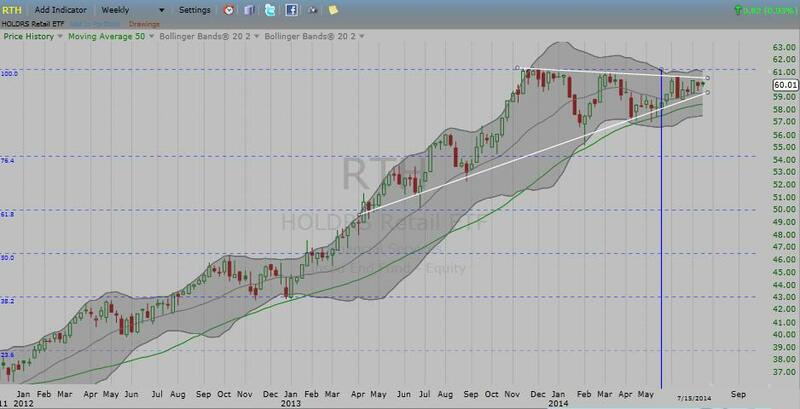 This is the monthly Russell 2000 (RUT) and this years consolidation and soon possibly relabeled top is testing both a quite nicely proportioned double head and shoulders neckline, the 23.8 FIBO, and 20 - period simple moving average at center ot the Bollinger Band. So there is quite a substantial supportive convergence here that if broken could give us move to under 1000. COMP dropped right through 200 DMA but still may get some reaction here but looks like this could easily drop to 4000 in a hurry. Actually in black with all of my trades: Holding Both SBB positions, crude short DNO, and dollar long USDU. RUT had solid break of neckline. Dow holding somewhat better. Biotechs and Retail still holding strong?? Prechter at Elliott Wave Int'l boldly proclaiming this was "THE TOP!" Bert Dohman only other one I see also putting his reputation on the line already, he's actually had a pretty good record. Regardless if the bear is just starting there will be plenty of opportunities to aggressively short with less risk. XLE Energy ETF in first wave of a crash. Clear Elliott Wave A-B-C with huge B-wave triangle completed on way up. 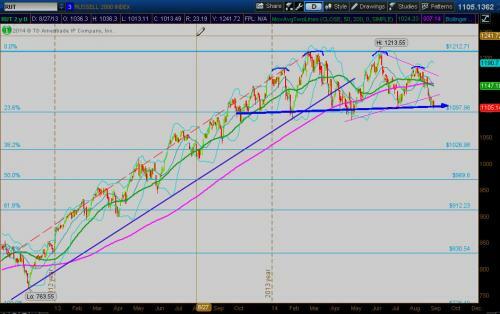 We should catch some significant support as we enter the triangle's trend mirror. I've marked a likely point in yellow. Will be interesting to watch pattern in first large degree correction/consolidation or Wave 2 but hoping it provides a fairly low risk shorting opportunity.